Killer upgrade for your new 1/16 Summit VXL. This is for 1 pair of our new 1850 7.4V lipo packs. One left side and one right side custom wired to fit the Summit VXL battery compartment with no modifications required. By using these packs in parallel, you will be running a 3700 7.4V setup. This will double your run time. Do NOT run these packs in series when using them in the new Traxxas Summit VXL or you will damage your system. They are only to be run in parallel which doubles the capacity instead of the voltage. 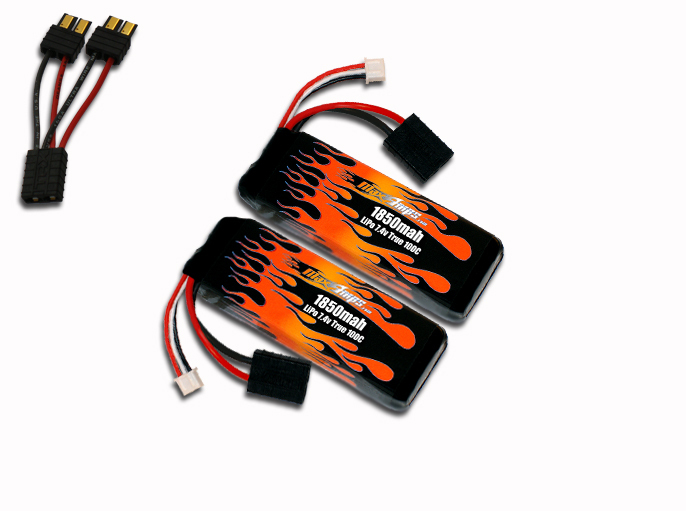 awesome battery.will definitely buy more..
Great power even compared to other small lipos. Love maxamps batteries! They cost a Lil more but you get a lot more quality and the customer service is outstanding. Mix that with waterproof and fresh made cells. Why bother with other brands. This battery pack turned my mini 8 into a speed demon! The tray adapter fits perfectly snug. Great quality, fast shipping time, amazing customer service! So far so good and will definitely purchase another. I haven't had a chance to use the new battery pack yet, as I only needed it at this stage of my RC Sailboat build to plan where to place the battery under the deck. But if it performs as well as my other MaxAmp batteries, I'll be extremely happy.